James Monroe, U.S. Senator; Governor of Virginia; Minister to France, England, and Spain, and fifth President of the United States, purchased this farm, originally named Highland, in 1793. 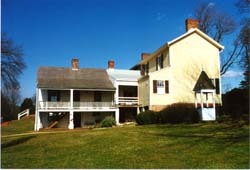 Monroe's friend and mentor Thomas Jefferson selected the house site within view of Jefferson's Monticello. 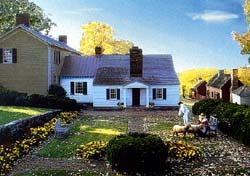 Monroe had hoped to move immediately from his farm at the present site of the University of Virginia so that he could be closer to Jefferson. But when Monroe's appointment in 1794 as minister to France indicated a long stay abroad and a delay in house construction, he sent instructions from Paris giving Jefferson full authority to locate the house at Highland and to plant its orchards. Monroe completed the simple farmhouse, the western portion of the present building, in 1799. Calling the house his "castle cabin" he added to it over the next 20 years. The Monroe family considered Highland its home for a quarter century. Monroe intended Highland to be a working farm. To increase its productivity, he experimented with diverse crops and planting methods, becoming, like Jefferson, an early advocate of scientific agriculture. In addition to his principal crops of timber, tobacco, and grain, he, also like Jefferson, tried to cultivate Bordeaux grapes for wine, a frustrating endeavor for all farmers until modern agricultural methods were developed. Throughout his two terms as President, 1817-1825, Monroe often spoke of retiring to Highland. Unfortunately, pressing debts, largely as the result of government service, combined with Mrs. Monroe's poor health, forced Monroe to sell the estate in 1826, and retire to Oak Hill. He described Highland at that time as 3,500 acres with a "commodious dwelling house, buildings for servants and other domestic purposes, good stables, two barns with threshing machine, a grist and sawmill with houses for managers and laborers . . . all in good repair." Highland, showing the many extant outbuildings on the right, and the 1880s addition on the left. About 1840, by which time subsequent owners had changed the name of the house to Ash Lawn, one wing of the Monroe house was damaged by fire and partially removed. In the 1880s, Parson John Massey, a retired Baptist minister and later Lieutenant Governor of Virginia, built the two-story Victorian section of the house partially over the foundation of the damaged Monroe wing, expanding the house to its present size. Jay Winston Johns of Pittsburgh, Pennsylvania, purchased the plantation in 1930 for his residence and formally opened it to the public, and after his death willed the property to the College of William and Mary, which Monroe had attended prior to his service in the American Revolution. The College began systematic research and restoration of Ash Lawn and reopened the property for public visitation in 1975. Ash Lawn-Highland is located at 1000 James Monroe Pkwy., southeast of Charlottesville off Rte. 53. It is open from March-October daily 9:00am to 6:00pm and from November-March daily 11:00am to 5:00pm, closed Thanksgiving day, Christmas day, and New Year's day. There is a fee for admission. Call 434-293-9539 for further information or visit the website.